How do our children find role models? I was rummaging through some old files at work when I ran across some writings and mementos from my daughters. 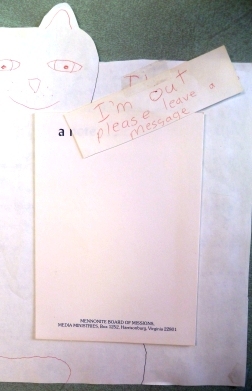 … A “While you were away” homemade note pad, complete with a “refill now” note at the end(!). Remember those? 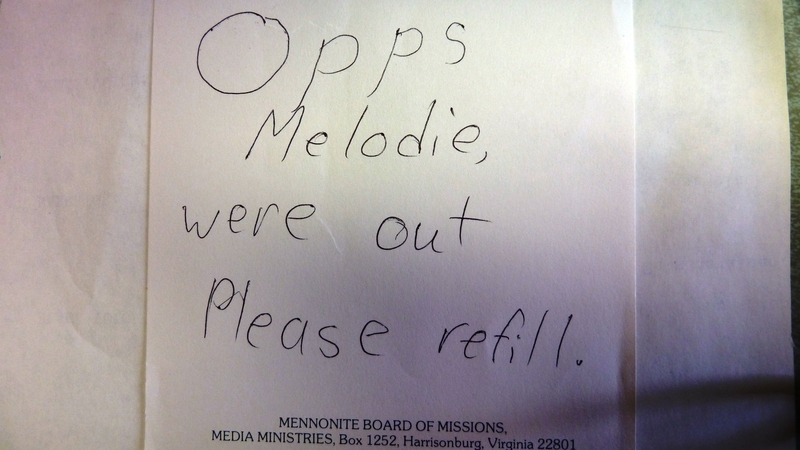 For receptionists to write out messages for workers who missed a phone call or visitors? Yes, people were paid to write out messages for others. 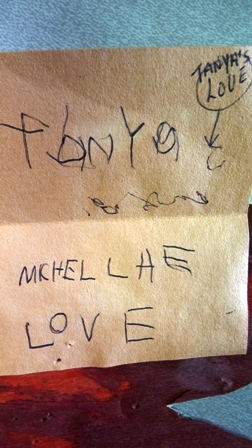 I’m guessing this “note pad” was Michelle’s handiwork (with two spelling errors she’d never miss today). Now that my daughters are all happily situated in jobs related to their college majors, it amuses me that they are all office workers just like me—even though in different fields and specialties. I never like to reveal identifying specifics here but one is an advertising account manager at a large city newspaper, one an artistic administrator for a medium sized city symphony, and the third works as a certification coordinator for a national environmental organization. From my youngest. 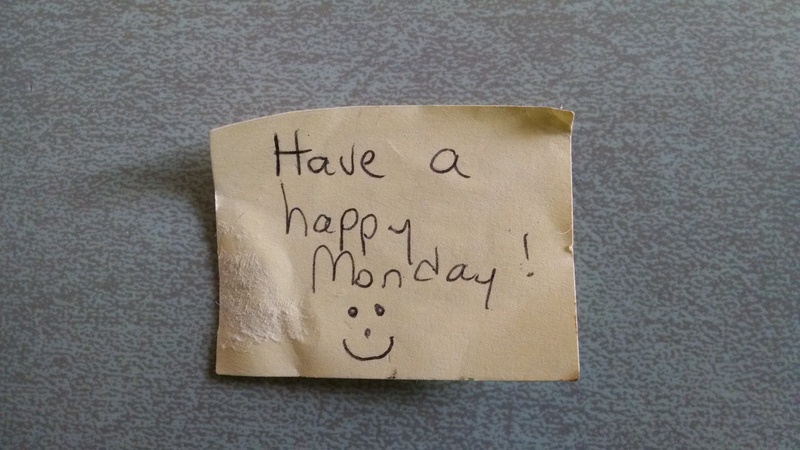 Always a great note to find on a Monday. If I had become a nurse or doctor or teacher or store manager would we maybe have ended up with one of them in education or medicine or retail? Much more likely. I always encouraged them to go into the medical field because I don’t see it being phased out anytime soon. But I am very happy with where they are! 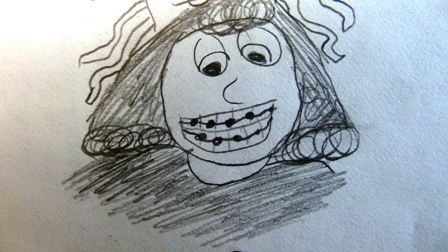 “Braces” by Tanya, the only one who never wore braces. But they did like to play office and library and bank. They also played the “poor” game when they dressed up like ragamuffins and scrounged nuts and bean pods off the “cigar tree” (Catalpa) for their pretend food. Not sure where that came from but their marvelous and active imaginations, and perhaps their experiences in our church and helping with the church Clothes Closet. The other discovery I loved in this file were early drawings that I had actually dated (yay Mom). … which are interesting now that my grandsons are getting a little older. 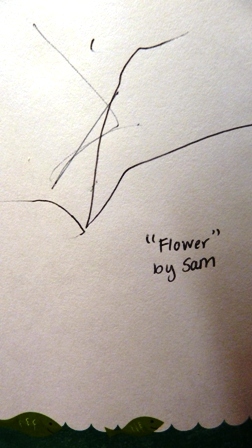 The older of the two, Sam, now 21 months, has begun scribbling and for Father’s Day added a “drawing” and “name” to the card for Grandpa (below). 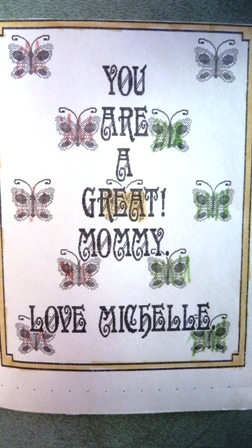 Not only that, look at how his mother labeled his drawing—just like I had labeled hers years ago. She hasn’t seen her drawings for many years. So where does that come from? Finding patterns, and loving it! Of course the patterns can be negative, as well. But we won’t talk about those here. And while our daughters have not followed their dad into a factory warehouse, I love that somehow he managed to raise all of them so they are handy around tools, don’t mind outside or dirty work, and are more concerned about their work ethic than wearing huge amounts of make up or designer labels. Two years ago, when two of them were expecting. Best of all, they love their new roles of mommy, and auntie. Maybe seeing patterns there, too! Homemade computer card from our first computer & dot matrix printer. Did you end up in a job like your mom, or dad? Have your children followed their parents into similar fields? I’d love to hear your stories! What other patterns do you see through the generations? Adorable! 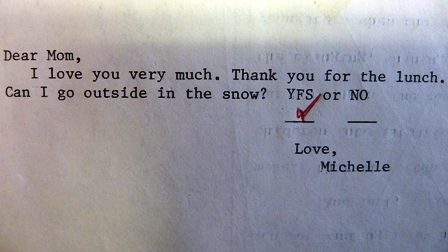 I had to laugh at Michelle’s Yes/No note. 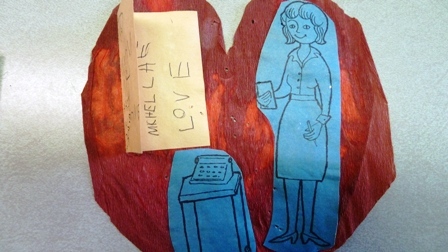 Love the valentine of you at the office – great role model, Melodie. I’ll have show Cliff the drawings. Our son Joel is a photographer and art instructor. Crista does fluid drawings and loves landscaping with plants like women on both sides of the family. She says, “I have farmer genes – ha!” Grandson Patrick wrote a book entitled “My Life as a Pencil” that his school had bound for its library. Curtis ended up in the top 5% of students in Duval County. Jenna got a note from her teacher about taking the initiative in picking up trash during recess. And so it goes . . . I was excited when I found these, obviously. Glad you could enjoy them as well, Marian. I love thinking about the artistry of landscaping–that’s a skill for sure, which skipped me. (I garden, but don’t feel I have the knack of landscaping) I think you’re saying the children have followed, somewhat, the footsteps of those of you who’ve gone before. Awesome. Yes, I took the mental leap without saying “patterns in parents our children/grand-children have followed. 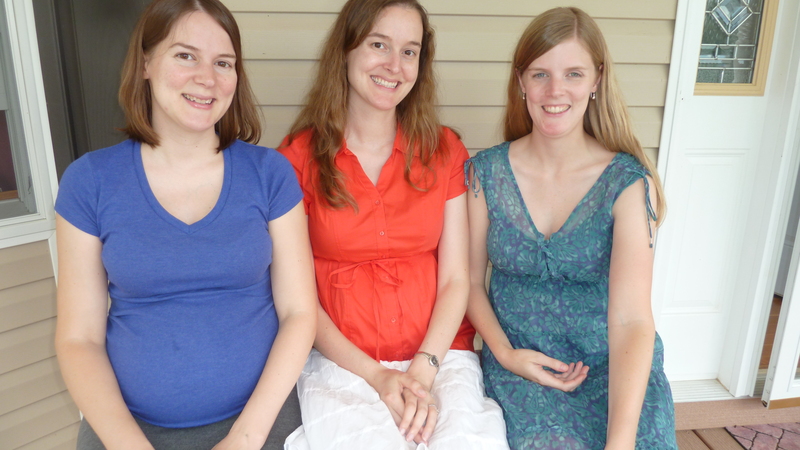 It’s nice when you can picture the girls–and knew them in those earlier stages! Do you remember the day Lauren babysat for Tanya and Doreen–I’m sure you were in the background too. Can’t remember if Michelle was there too or if she had somewhere else to go! We seem to be following the same path with memorabilia. 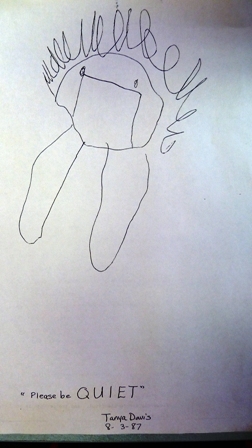 I saved quite a few drawings and notes from children too. I even framed one painting from each child. 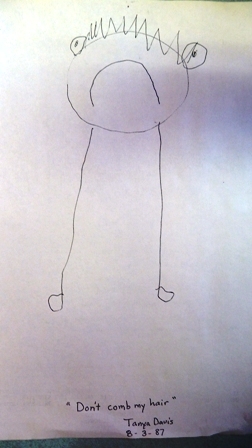 And original art from grandchildren is displayed on our refrigerator gallery. As for following. Both of our children are entrepreneurs. My son is a co-founder of an ed-tech company and works from home. My daughter also works from home as a business coach and air bnb host. Both of them, however, use many of the same skills required to be a good professor and administrator, the careers of their parents. I didn’t know about your daughter hosting air bnb guests. Interesting! I know that the skills & know how of your kids have helped you out a time or too in launching your book. I love being able to lean on one daughter who is a skilled editor for proofing at times for some quick feedback. I still could not bear to part with them even though my youngest will be 50 in December! I love the fact that you couldn’t bear to part with those notes even though your child is no longer a child. 50! I was a bit blown away this week when my sister mentioned her sons celebrating birthdays at ages 43 and 45. Makes me feel old. I’m glad you’re catching up with emails and it was fun to find your two new comments this morning! Yikes ! When our Baby Princess turns 50 in December, all four of our children will be in their 50’s The oldest turns 57 next week!